David Cameron has taken a few moments out of the busy election campaign to get behind a spoof website dedicated to unearthing facts about him. David Cameron has taken a few moments out of the hectic election campaign to get behind a spoof website aimed at unearthing facts about the Conservative leader. 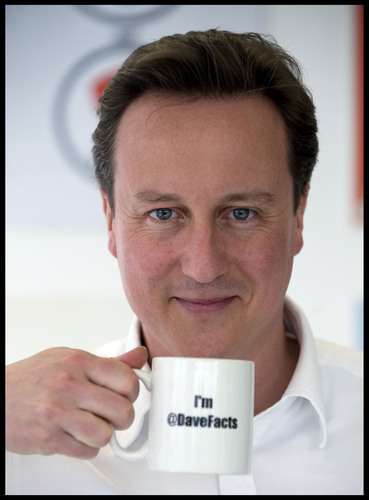 The team behind http://www.DavidCameronFacts.co.uk were amazed to receive a picture of David Cameron holding one of their "i'm @DaveFacts" mugs, courtesy of one of the Conservative media team. The site is totally independent of the Conservative Party and has been in beta testing for the past three months. During that period members of the public were invited to submit their own facts about David Cameron that were then vigorously investigated and reviewed for accuracy.